Over the past fifteen years, as I’ve spent time researching the life and career of the Yiddish author Jacob Dinezon, one piece of information has eluded me: the name of Dinezon’s older sister with whom he lived in Warsaw from the mid-1880s until his death in 1919. Yet there is no mention of Dinezon’s sister’s name in any of the Haynt’s extensive coverage of Dinezon’s final hours and elaborate funeral. Having now entered the centennial year of Dinezon’s yortsayt—the 100th anniversary of his death—I finally decided to reach out to the members of the JewishGen Discussion Group to see if anyone could help shed light on Dinezon’s sister’s name. JewishGen is a genealogical website offering the ability to search millions of records in a vast array of online databases. (Learn more on Wikipedia or watch a touching video about the organization.) Volunteers belong to a variety of special interest groups (SIGs) and provide answers, insights, and translations to people who are working on ancestry questions and family trees. I receive email digests from several SIGs and have marveled at the information that is shared between participants. On January 17, 2019, I posted an inquiry to JewishGen seeking suggestions on ways to locate Jacob Dinezon’s sister. 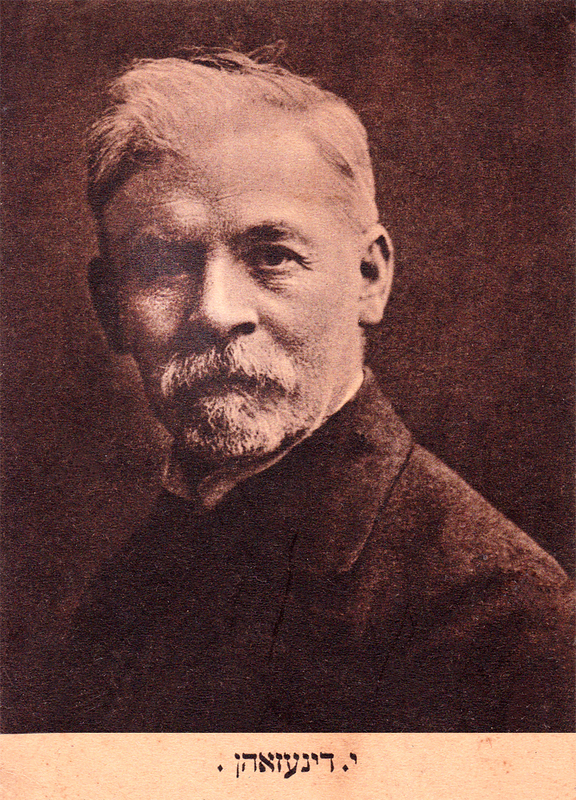 I noted that Dinezon had lived with his sister and her family (including two daughters) at Dzielna No. 15 and Karmelicka No. 29 in Warsaw. I also mentioned the various transliterations I had found of Dinezon’s name: Dineson, Dinesohn, Dienesohn, Dynezon, and Dynesohn. 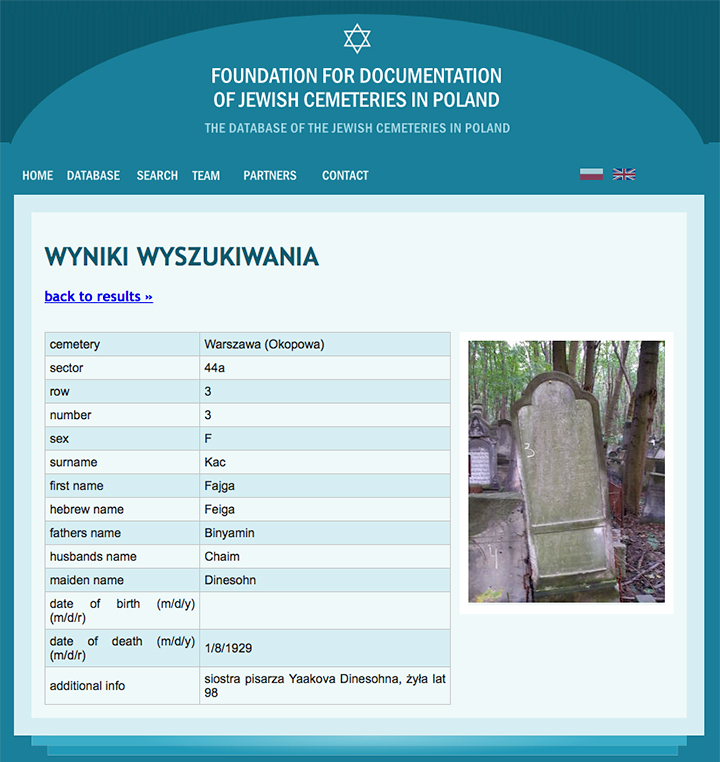 First, Nicole and Simon used the search engine Genealogy Indexer created by genealogist Logan Kleinwaks to search for Jacob Dinezon in the 1908 Adresy Warszawy (Warsaw Address and Business Directory). 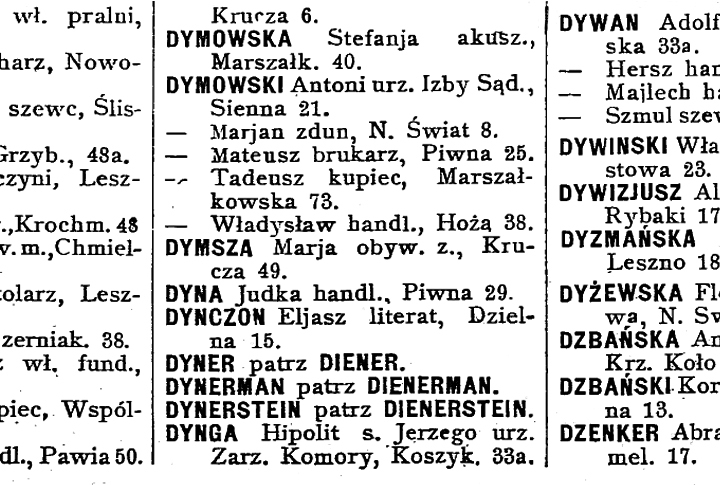 What they found was a listing for “DYNCZON Eljasz literat, Dzielna 15.” Dynczon, a new transliteration for Dinezon! 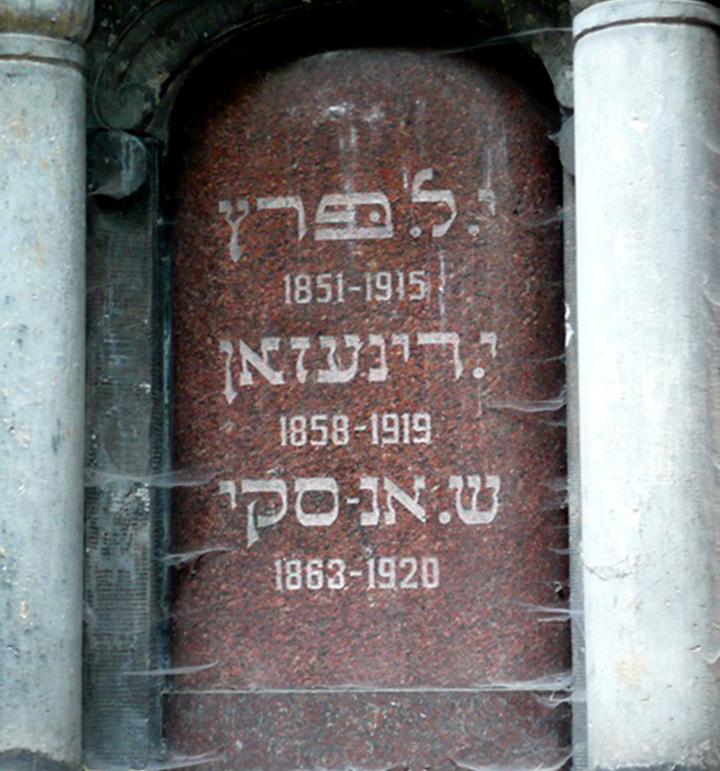 Then, using the database at JRI Poland (Jewish Records Indexing – Poland), Nicole discovered a memorial notice for “KAC, Fajga,” with a notation that her brother was “Jakob Dineson, writer.” Simon supported this with an image: the announcement of “Fajgi” Kac’s headstone unveiling in the Nasz przeglad: Organ niezależny. Here was information about Dinezon’s sister Fajga (Feiga) Kac: her father’s name was Binyamin, her husband’s name was Chaim, her maiden name was Dinesohn, and she died on January 8, 1929. She was the sister of writer Yaakov Dinesohn and she lived to be 98 years old. 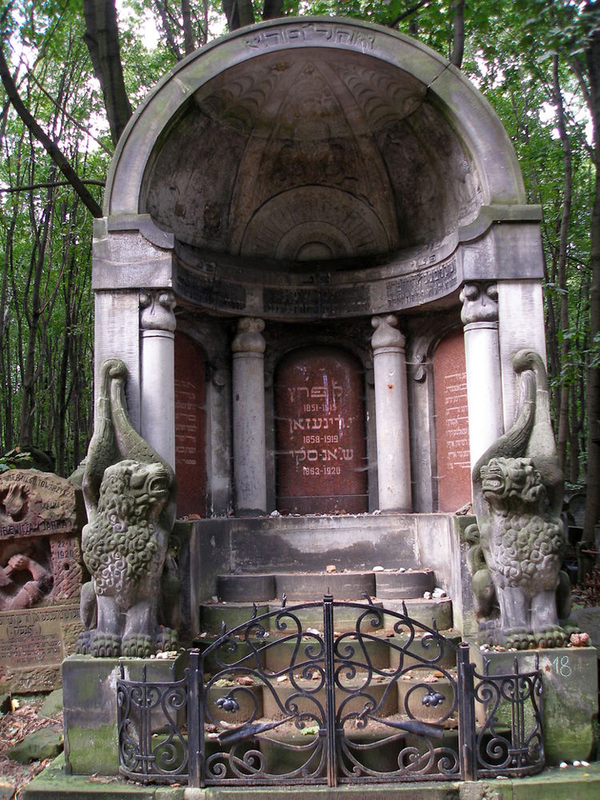 The database also showed a photograph of the “Mausoleum of the Three Writers” where Dinezon is buried with the Yiddish authors I. L. Peretz and S. Ansky in Warsaw’s Okopowa Cemetery. Now, if you look closely you will see Dinezon’s name in the middle with the dates 1858-1919 etched in the stone. This brings us to the other amazing discovery from our JewishGen researchers. For years scholars have been struggling to determine the year of Jacob Dinezon’s birth. 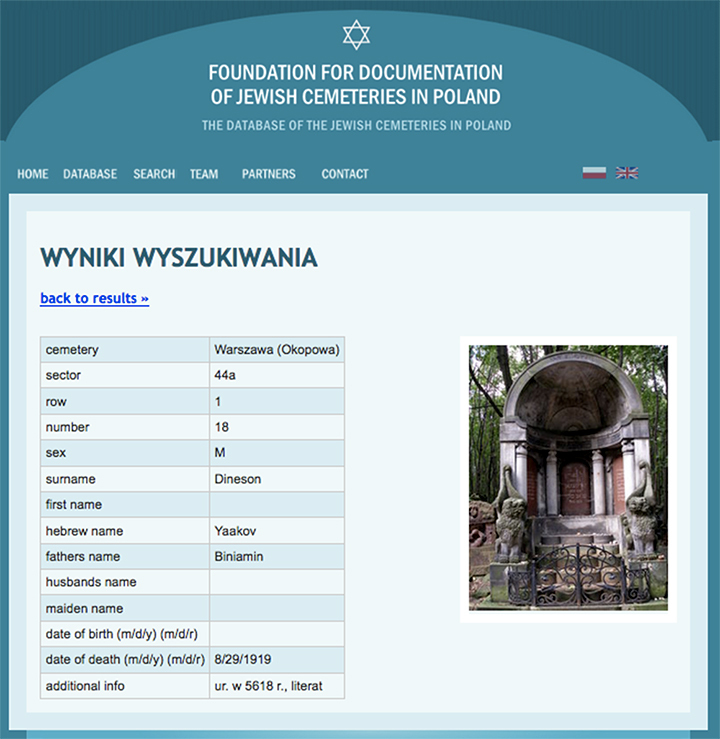 The most common date you see mentioned in biographical entries is 1856 (as shown in the image from the Warsaw cemetery database above). Some references cite 1852 and the Haynt at the time of Dinezon’s death reported the year 1851. Finally, the work of Simon Srebrny and Adam Teitelbaum may resolve this issue. 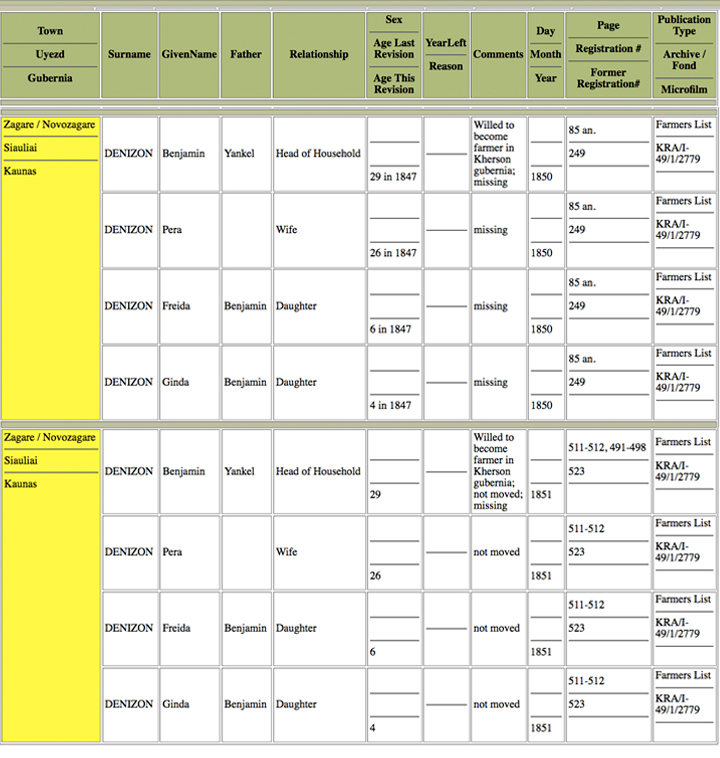 As both researchers continued to investigate the Dinezon family tree, they discovered census information from Zagare, Lithuania for the years 1847, 1850, and 1851 in the Litvak-SIG database. There they uncovered a family named DENIZON that included a head of houshold named Benjamin Denizon, his wife Pera, and two daughters, Freida and Ginda. Listing for the Benjamin Denizon family in the LitvakSIG Database, 1850, 1851. Then the find! Again in the Litvak-SIG database, the 1858 census had a completely different spelling of the family name: DINERZUN. Included in this listing is a son: Yankel Eliash, seven years old! Again, the father is Benjamin, the mother is Pessa, the two daughters are Goda and Freyde, and there’s even a new sister, Chane. 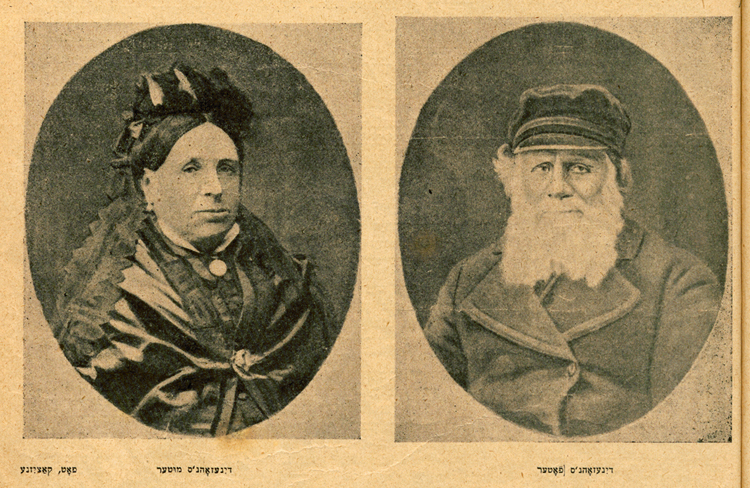 Now we have names to go with this wonderful photograph of Dinezon’s parents that was sent to me by Dr. Agnieszka Żółkiewska of the Jewish Historical Institute in Warsaw, Poland. 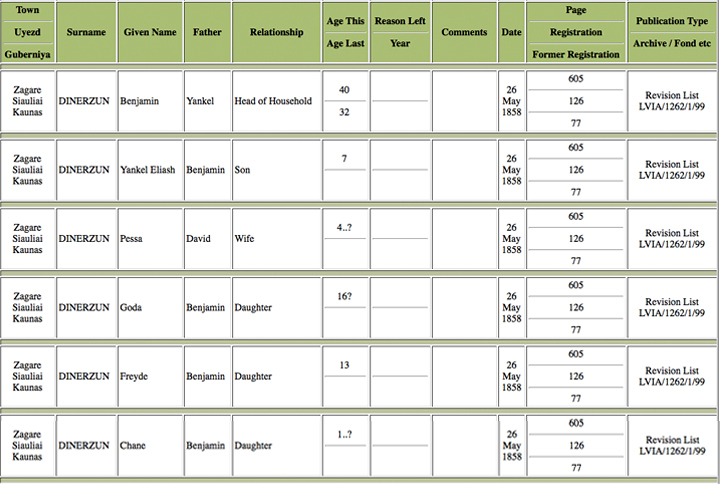 So finally, through the miracle of modern technology, and all the volunteers who inputted volumes of data, we see that Yankel Eliash Dinerzun, son of Benjamin, was seven years old in 1858, and thus, was born in 1851! At last, confirmation of Jacob Dinezon’s birth year, and verification of what appeared in the August 29, 1919 edition of the Warsaw Yiddish newspaper, Haynt.